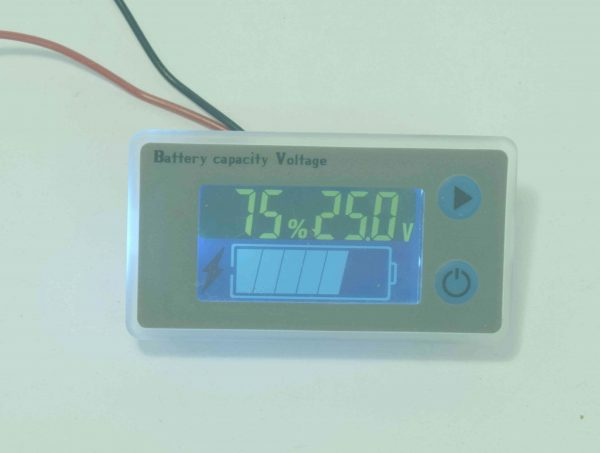 A neat LCD battery meter that works from 10V to 100V. It has a temperature display, low battery alert, and backlight. It can be switched to work with lead acid, LiPo, or LiFeSo4 batteries. As standard they are set for 24V lead acid batteries but can be programmed to work with LiPo and LiFeSo4 batteries from 10V up to 100V. They’re not the most water resistant of designs, so not really suitable for exposed locations unless you use silicon sealer. *The LiPo and LiFeSo4 battery settings use a fairly crude linear interpretation between the full charge point and the empty point. As such the % capacity remaining is not particularly accurate in the mid-range. If this is important to you then have a look at our own design BCM-5P1, we wrote the software for this so we know it’s more accurate.